I grew up watching old musicals. I memorized the song lyrics, I danced along, and I didn’t just fantasize, I visualized playing the characters some day. 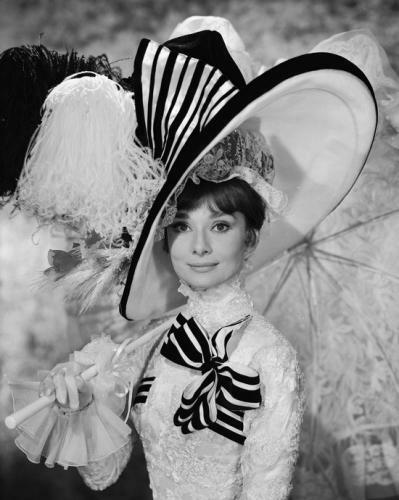 Musicals were oxygen, and one of my favorite musicals was My Fair Lady. Eliza Doolittle was my #1. True, I wanted to be Audrey Hepburn (and, yes, I still do). But the Pygmalion transformation struck a chord. Critics love to paint big fat red letters on Cinderella-like tales, but to me, the story was less about misogyny and more about expression. Eliza Doolittle might have learned proper diction and a more graceful cadence that allowed her to move up in social circles, but she also learned how to use her voice more effectively without losing who she was as a stubborn, feisty, independent woman along the way. Her new, smooth voice allowed her freedom and movement toward the life that she wanted for herself – one that included empowerment and respect. She said no to poor, sappy Freddy, because she could. And she ended up back with stodgy Henry Higgins, because she chose to. Though Freddy swooned over her, Henry had seen her at her most vulnerable. Bear with me for this horribly redundant phrasing, but Higgins saw how hard Eliza worked to be treated the way she believed she deserved to be treated. Yes, Eliza Doolittle always felt like my kindred spirit. Like her, I could have sung and danced all night...but speaking gracefully was another story. So, as a young girl who was only fluent when singing or performing, musicals felt like home. And a musical about a young woman who struggles to change her speech was basically a biography. I found the techniques used by obstinate Henry Higgins absolutely fascinating. Sure, he was ruthless and egotistic. Yet I hung onto his every word as he spoke about the beauty of the English language, as he pontificated on the importance of conquering it. I could relate to Eliza trying to ignite the flame with the “h” sound – in the right places – and trying to speak with a mouth full of marbles. I could feel her difficulty in trying to figure out where to place her tongue in order to emit an appealing sound. The scene where she shrieks, “Come on, Dover! Move your bloomin’ arse!” was, for me, a secret double entendre. It epitomized my deep connection with Eliza’s character. Eliza had things to say, and she was going to be heard. Her voice – somewhat ugly to the plummy genteel – was authentically hers. And sometimes it just erupted. Speaking smoothly required a great deal of control, and Eliza found it so exhausting that sometimes she had to loosen her grip and let her broken words move freely. I admired her gumption, her ability to get so caught up in the moment that she let down her carefully constructed guard. Her passionate shriek released the breath I held throughout the rest of that stifled scene, when she’s trying so darn hard to mold her words and postures into the picture of perfect elegance and class. For me, “move your bloomin’ arse” was not only about letting go. It was also about moving beyond stuckness – about getting any words out. If I had an inner mantra for every time my Big Stuck popped up, it would likely be something very akin to “Move your bloomin’ arse!” In other words, get out of my way and let me express the words that are busting at the seams to be heard. Yes, Eliza was feisty, headstrong. Yes, she was her own woman. But, deep down, she simply wanted to speak better. That was her golden ticket to her dream of working in a flower shop. Her voice was her way of proving – to herself and to others – that she was intelligent, independent, and capable of making her own way. At least, that’s what her story was to me.